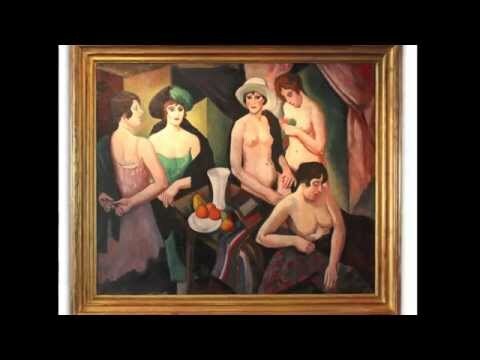 “Reunion de Femmes”: oil on canvas, signed and dated 1921. Framed in 20th century gilt wood. Dubois de la Patelliere kept this piece in his studio until the end of his life because he loved it so much, it is considered his most significant work. It was sold one time since then in 1995 at a record price for the artist, and has also been sold recently on auction for (again) a record price compared to the other works by the artist. Morateur Gallery has been contacted by a museum in France to ask to exhibit this piece in a retrospective of the artist in 2014. They explained that it is quite vital to have this piece because it is his most important painting. Titled on the frame "Reunion des Femmes"
Measurements: 59" x 71" - Approximately H.6' x W.7' x 5" Depth with the frame.